So You Can Write Publications, LLC presents the Black Excellence Academic Scholarship Fund to assist students striving for greatness. Milwaukee, WI, January 06, 2019 --(PR.com)-- So You Can Write Publications is a publishing company designed to assist writers with their writing works. This company has a reputation built off good faith and character, they believe in making their clients feel at home during the publishing process. It is their greatest duty to provide ongoing services that meet the needs of each writer’s individuality. Helping the community build vision by understanding the talent that’s within. Your dreams are reachable! This scholarship was created to help assist African American students striving to be great. So You Can Write and Founder Author Kendrick Watkins designed this scholarship knowing how costly education can be. Any products purchased from So You Can Write Publications allows 5% of the proceeds to be directed to a separate account representing the Black Excellence Academic Scholarship Fund. At the ending of each year starting 2019, the accumulated funds will be granted to the qualified candidate that meets the terms and conditions of the scholarship. Qualifications are: must be African American descent, maintain at least a 2.8 GPA or higher throughout the semester, and write a thousand-word essay addressing why they should receive the scholarship along with their future goals. Anyone can also donate to the scholarship without purchasing products or services from So You Can Write Publications and will receive a free So You Can Write Publications pen, bumper sticker, and name recognition during scholarship giveaway. 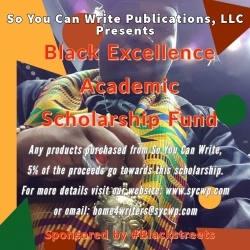 All questions about sponsorships to the Black Excellence Academic Scholarship Fund and donations without product purchase, please email to home4writers@sycwp.com.